The Shannon pleated window valance with button accents from The Curtain Shop is a woven textured semi sheer linen blend window topper in a beautiful linen poly blend. A fabric-covered button is at the top of each of two pleats. This unlined machine washable valance by Ricardo Trading is available in seven colors to complement your home décor. Choose grey, white, toffee, natural or cocoa. The curtain is 52 inches wide and 15 inches long, which will fit a standard window. For wider windows, simply order two and thread a longer curtain rod through the 3-inch rod pocket. These lovely Shannon valances are semi-sheer window toppers crafted of a linen-blend fabric to create a beautiful new focal point in your favorite rooms. The color choices from The Curtain Shop are white, natural, gray, toffee, cinnabar, lavender and cocoa. This 52-inch wide valance with a crescent border will accommodate standard window sizes from 36 inches to 46 inches wide. The length is 13 inches at the center and 18 inches at the sides on a window topper with a 1 1/2-inch curtain rod pocket. Order two or more for larger window sizes. Machine wash using a cold water, gentle cycle. 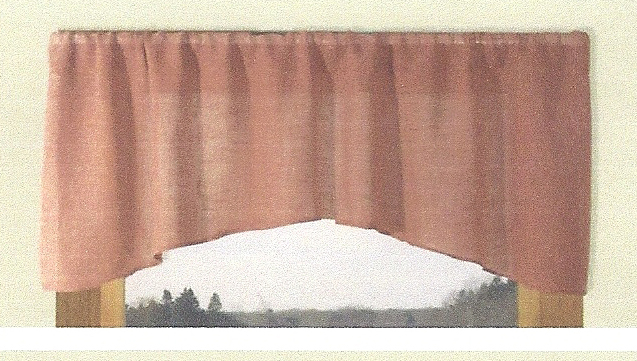 Shannon Crescent Valance is a lovely semi sheer window topper made with a "linen look" fabric. It features a 1 1/2" rod pocket with no header. Not lined. Dimensions: 52"W x 18"L (sides) x 13"L (center). Fits a standard single window. Use multiples to accommodate wider windows. Colors: White, Natural, Toffee, Cinnabar, Grey, Lavender, and Cocoa. Fabric Content: 15% Linen/85" Polyester. Machine wash cold water, gentle cycle. Tumble dry low heat, and low iron to touch up as needed. Long lasting, luxurious Linen blended with durable Polyester and pre-washed to capture this comfortable feel so popular in today's homes. Nice, clean lines and fresh colors are also hallmarks of these lovely Linen/Polyester panels. Panels have a 3" rod pocket and no header. Pleated Button Valance featuring covered buttons at top of each pleat or the Crescent Valance completes this beautiful ensemble. Made of 15% Linen/85% Polyester.